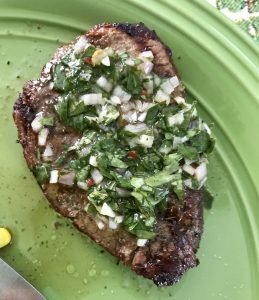 Nothing screams summer time to me like grilled steak with chimichurri sauce. Loaded with fresh herbs it comes together within minutes and really compliments any cut of meat. I usually pair it with flat iron, tenderloin or strip steak. 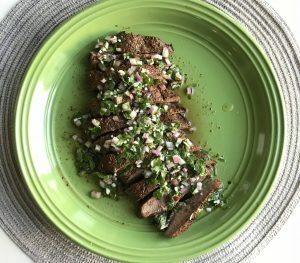 A quick salt and pepper season on your steak is all you will need as this sauce does all the flavoring for you. Red meat not your thing? Pour this over pork, chicken or tofu and you won’t be disappointed. Makes enough for 1lb of meat. Grill your steak to your desired doneness, and let rest. While your steak rests zip everything up in a food processor or chop fine by hand. I prefer a more rustic sauce so I chop it by hand. I like to use apple cider or red wine vinegar, however white would work too. 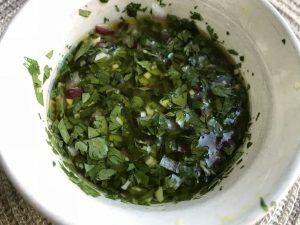 The optional tablespoon of water is to thin out the sauce a little, this could be done with additional olive oil as well. It’s that easy! Once everything is combined, pour over your steak and enjoy! Side note friends, this is totally Keto!! 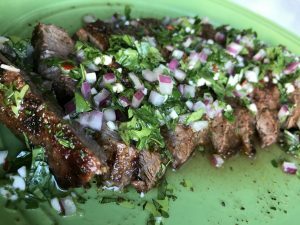 Chimichurri is such a flavor bomb. 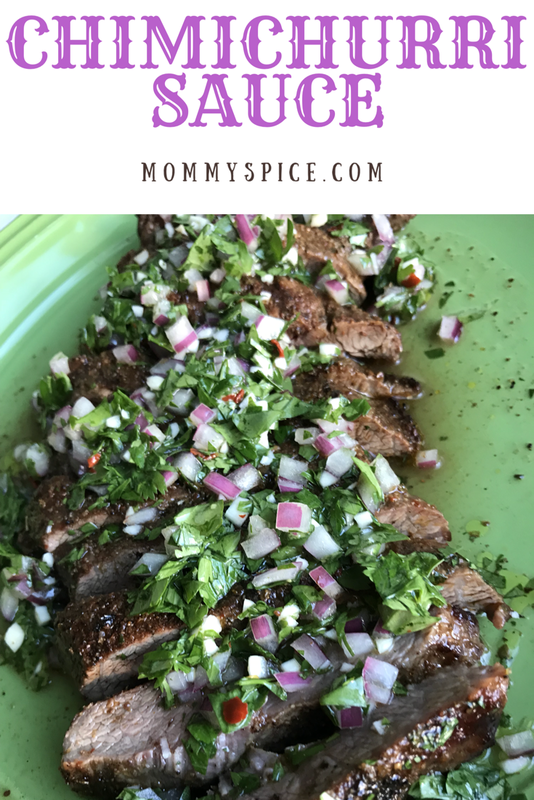 My husband used to love when I would serve these steaks with baked or mashed potatoes. He would just dump it all over his plate like a gravy. My tip for this one, play around with your herbs and acid. 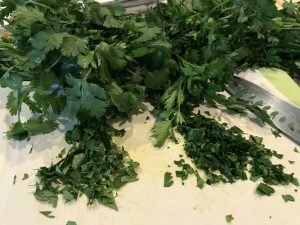 Some people don’t have a taste for cilantro, you can substitute fresh oregano or go all parsley. Don’t have vinegar on hand? Try lemon or lime juice. This is a hard one to mess up so have fun with it. I will say my husband used to really hate raw onion, and this recipe changed that for him. A single ingredient doesn’t make a dish, so push your boundaries, there really is such a science to recipes and flavors.